[[Handwriting]] I.C. 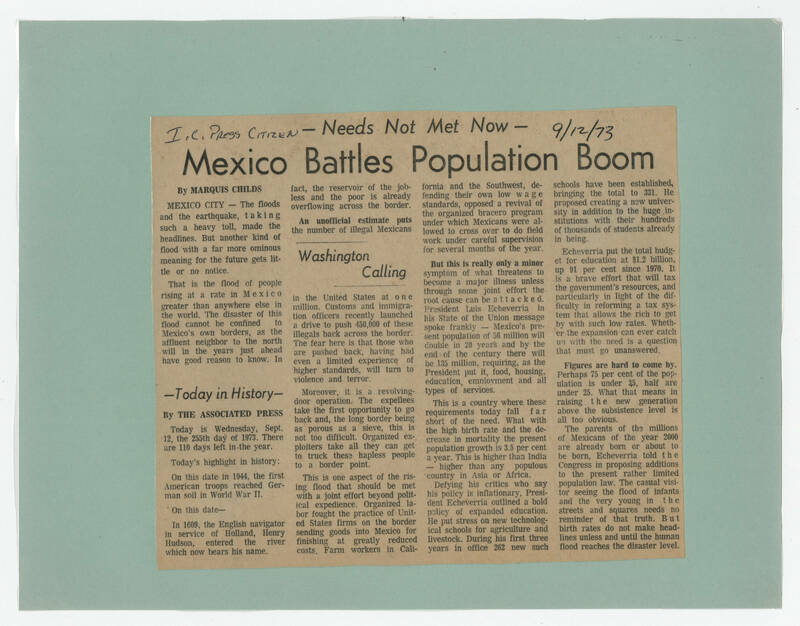 Press Citizen 9/12/73 [[End handwriting]] -- Needs Not Met Now [[ [[Header]] Mexico Battles Population Boom [[end header]] [[bold]]By Marquis Childs[[end bold]] MEXICO CITY -- The floods and the earthquake, taking such a heavy toll made the headlines. But another kind of flood with a far more ominous meaning for the future gets little or no notice. That is the flood of people rising at a rate in Mexico greater than anywhere else in the world. The disaster of this flood cannot be confined to Mexico's own borders, as the affluent neighbor to the north will in the years just ahead have a good reason to know. In fact, the reservoir of the jobless and the poor is already overflowing across the border. [[bold]]An unofficial estimate puts[[end bold]] the number of illegal Mexicans [[large text in middle of article]]Washington Calling[[end text]] in the United States at one million. Customs and immigration officers recently launched a drive to push 450,000 of these illegals back across the border. The fear here is that those who are pushed back, having had even a limited experience of higher standards, will turn to violence and terror. Moreover, it is a revolving door operation. The expellees take the first opportunity to go back and, the long border being as porous as a sieve, this is not too difficult. Organized exploiters take all they can get to truck these hapless people to a border point. This is one aspect of the rising flood that should be met with a joint effort beyond political expedience. Organized labor fought the practice of United States firms on the border sending goods into Mexico for finishing at greatly reduced costs. Farm workers in California and the Southwest defending their own low wage standards opposed a revival of the organized bracero program under which Mexicans were allowed to cross over to do field work under careful supervision for several months of the year. [[bold]]But this is really only a minor[[end bold]] symptom of what threatens to become a major illness unless through some joint effort the root cause can be attacked. President Luis Echeverria in his state of the Union message spoke frankly -- mexico's present population of 56 million will double in 20 years and by the end of the century there will be 135 million, requiring, as the President put it, food, housing, education, employment and all types of services. This is a country where these requirements today fall far short of the need. What with the high birth rate and the decrease in mortality the present population growth is 3.5 per cent a year. That is higher than India -- higher than any populous country in Asia or Africa. Defying his critics who say his policy is inflationary, President Echeverria outlined a bold policy of expanded education. He put stress on new technological schools for agriculture and livestock. During his first three years in office 262 new such schools have been established, bringing the total to 331. He proposed creating a new university in addition to the huge institutions with their hundreds of thousands of students already in being. Echeverria put the total budget for education at $1.2 billion, up 91 per cent since 1970. It is a brave effort that will tax the government's resources, and particularly in light of the difficulty in reforming a tax system that allows the rich to get by with such low rates. Whether the expansion can ever catch up with the need is a question that must go unanswered. [[bold]]Figures are hard to come by. [[end bold]]Perhaps 75 per cent of the population is under 35, half are under 25. What that means in raising the new generation above the subsistence level is all too obvious. The parents of the millions of Mexicans of the year 2000 are already born or about to be born, Echeverria told the Congress in proposing additions to the present rather limited population law. The casual visitor seeing the flood of infants and the very young in the streets and squares needs no reminder of that truth. But birth rates do not make headlines unless and until the human flood reaches the disaster level.